The i20 is a car designed to take on the supermini market. It was one of Hyundai’s first properly mainstream cars designed to help the manufacturer secure sales across the globe. With a three and five-door option, a diesel, petrol and a good-looking body shell, the Hyundai i20 was a welcome replacement for the ageing Getz. It may not be an obvious choice in the supermini market, but if you want something alternative, interesting and cheap, the i20 is a great option. Hyundai’s whole ethos – like a lot of eastern car manufacturers – is affordability. You don’t get German-quality build quality, nor do you get life-changing technology, but you get a decent small car that shouldn’t cost you too much to run. No i20 is fast, but it is a reasonable car and won’t feel all that sluggish to drive. 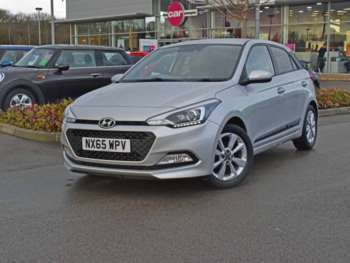 The usual list of airbags, safety equipment, CD player, air-con and a decent stereo system are all present, which should make a used i20 a viable option for drivers in the UK. It’s a car that will take you from A to B in comfort and relative safety. It’s a very good drive and does exactly what it’s designed to do. As a car that’s excellent value for money, it’s a perfect little all-rounder that drives well around town. Although the steering wheel may feel a little weighted, the car offers a comfortable ride. It handles well and it’s controlled around corners. Got a specific Hyundai i20 model in mind?